I started by examining several manuscripts to get a feel for what I wanted to do. First stop was the Aberdeen Bestiary. I started with this page https://www.abdn.ac.uk/bestiary/ms24/f7r and then looked at several others following. The page shows triangular marginal pricking and double lines for the frame. The lines are fairly thick compared to the thinnest part of the calligraphy, possibly a plummet, but that’s just a guess. The text is written just above the ruling line. The beginning of the text starts mostly at the second line of the frame but sometimes goes over. As does the ending text. The illustrations sometimes fill the entire text space, but sometimes are smaller, creating smaller columns of text. The lines appear to go under the illustrations, but they are heavily painted and it’s a little hard to tell for certain. The date of the Aberdeen Bestiary is 1200. Next I looked at the Luttrell Psalter here http://www.bl.uk/turning-the-pages/?id=a0f935d0-a678-11db-83e4-0050c2490048&type=book The ruling lines are very faint and I’m not entirely sure but there may be lines on both the top and bottom of the text (or it may be a shadow from the other side of the page where there is line filler.) The frame appears to be double lined, but it is very faint. There is a great deal of painting outside the text area, in the margins, which show evidence of being trimmed. The pricking holes are not in evidence on the pages I looked at. The Luttrell Psalter dates between 1320 and 1340. Next I looked at the Hunting Book of Gaston Phoebus. The entire book is not online but there are postings of individual pages. The first is here: http://www.omifacsimiles.com/brochures/phoeb.html The text for the book is set in two columns and the frame is done in single lines. The text is written above the ruled lines. Another page shows the same thing. Neither is high enough resolution to show pricking holes. Trying to find more bestiaries that are online I found this one, Manāfiʻ-i ḥayavān., from Iran http://ica.themorgan.org/manuscript/thumbs/77363 dated between 1297-1300 (with later additions done in the 19th Century). It is framed in red ink in double lines. The text appears to have no ruling lines. Image is not high enough resolution to see pricking holes. The last manuscript I looked at was the Jacobus de Voragine: Golden legend dating from around 1370. http://gallica.bnf.fr/ark:/12148/btv1b8479013d/f47.item.zoom The text is set in two columns within a single line frame. There is no sign of pricking holes. Because I want to do calligraphy on my vellum quire, I need to be careful about where and how many lines I can fit in my text space. I measured the size of the bifolium and then used the Golden Ratio/Golden Mean aka secret canon method to determine how much space the text should take up. It was sadly much less than I expected, so I went back to the words I’ve written for the project and edited it down, so no section is more than 14 lines. I decided that to mark the pages, I need to make a template. Historically, it would probably be made out of vellum, but I don’t have a piece to spare, so I will use cardstock. Likewise, some kind of awl (or knife) would be used to prick the holes. My awls are too thick for this job, and my pen knife is also too thick, so I think I will try a push pin. Making the template has used more modern tools than I would like, on how exactly this process was done. I used a computer to generate a ruling sheet, and then a light box to transfer the pricking locations to a piece of cardstock. Then I did the first sheet of the bifolium. I had to be careful to remember which were my framing lines and which were text lines. I still need to do the other sheet, both sides, but I wanted to get this turned in tonight. I’ll edit it and add the other sheet as soon as I get it finished. Added: Because I want to do this as a coherent book, I only have one ruling pattern. This is on actual vellum, done with a lead plummet. Here’s the second page taped before I put the template over it. Because I only have the one piece of vellum, I’m only making one quire. The next step in the process is to fold the parchment into quires, but before I do that, I need to prepare the vellum for writing and then cut it to size. However before I do either, I want to cut a couple of goose feathers for use as quills, one cut to a crowquill, the other to a broad nib for writing. I used a very fine sandpaper to smooth the hair side which was a little rough and to raise a slight nap on the flesh side, as it appeared too slick to write on. I then pounced both sides with pounce, dusting it lightly on the parchment and then rubbing it gently with a scrap of linen cloth. I’m not sure exactly what is in the pounce container. (I inherited it with some old art supplies but pounce can be made from finely powdered cuttlefish bone, gum sandarac, chalk or similar substances.) I also smoothed the hair side with a bone folder, but there is still a rough spot that is going to be very hard to calligraph over. Time to fold the quires! No problem with the first fold. The second fold was a little harder as the vellum folded was now thicker. Made the folds with the bone folder. Then I decided to trim the uneven edges with my Exacto knife. It’s not easy cutting through several layers of vellum! Next to cut the quires open. I’ll switch blades on the Exacto knife so it is totally sharp. And then I trimmed the pages again because they still aren’t even (and aren’t perfect after trimming). That was a little nerve-wracking. Next I put a hole in the spine to tacket my bifolum together. The most common tacket (thong used to bind loose bifolium pages together) is a sliver of parchment which I’ve done. Last I will mark the order of the pages. I have the text written out, though I may still do some editing on it. I do know the order of what I want on the pages and will use letters to mark each page. I’ll put the signatures in a box like the Lutrell Psalter. Luttrell Psalter: Catchphrase in a box. Here’s a website showing the step by step process of rebounding a choir book from Florence. Part way down the image labeled “The manuscript before rebinding” clearly shows the quires. I’m taking an online class about Medieval manuscripts and the first project is to create a simulated “parchment” after examining online samples. Of course, I have actual samples of parchment in my art supplies, but in interests of participating with the rest of the class that is doing the project according to the rubric, here goes. 1) I have in mind to do a few pages from a bestiary as the final project, so my first stop is to look at several pages from the Aberdeen Bestiary housed at the University of Aberdeen, Scotland. Looking at several of the pages, there does not seem to be a dramatic difference in color from the hair side to the flesh side, though the flesh side does have many obvious vein lines. The pages also show discoloration in the lower left and right hand corners, but I think that can be ascribed to turning the pages. The University of Abeerdeen claims copyright but allows for personal use and research purposes. 2) I’ve also looked at the Bedford Hours housed at the British Library, London, UK. The Bedford Hours do not show a lot of differentiation in color between the pages, nor a lot of obvious follicles or vein lines but a few. There is discoloration on the edges, but again that might be from handling over the years. 3) Next I looked at the “Golf Book”, an amazing work by the Flemish Master Simon Bening. 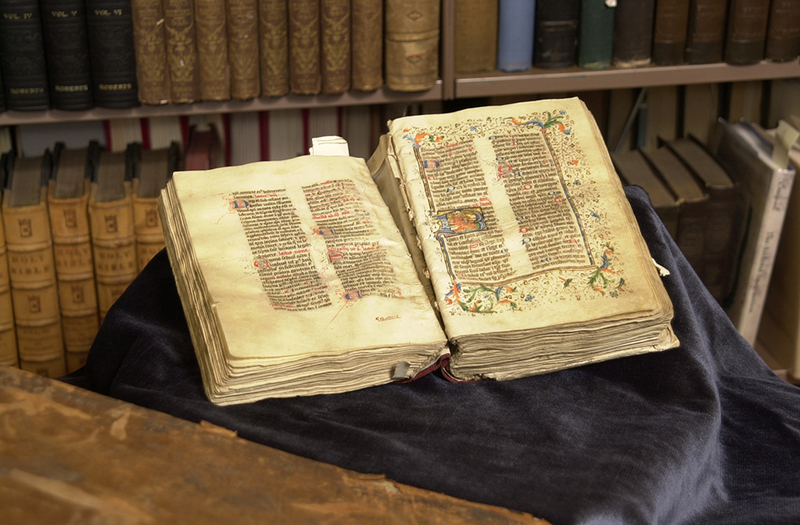 However the book is so lavishly decorated it’s hard to see the underlying parchment. There are a few discolorations in less decorated sections. Also housed in the British Library. 4) Last I went to look at the famous Book of Kells housed at Trinity University, Dublin, Ireland. The Book of Kells is the oldest of the manuscripts I’ve viewed and has the most dramatic color differences from flesh side to hair side with more visible follicles showing and some veining. It is discolored due to its age and has several visible repairs. Copyright 2012 The Board of Trinity College Dublin. Images are available for single-use academic application only. Publication, transmission or display is prohibited without formal written approval of Trinity College Library, Dublin. 5) Last I looked at some parchment that I have in hand. One shows a pretty dramatic change in color from the flesh side to the hair side, the hair side being more yellow. The other is less dramatic, but the hair side is more yellow than the hair side. The piece I would use for the actual project is cut from a half hide and is slightly more yellow on the hair side. Both sides have a blemish where the parchment looks a little thin but I’m excited to put this piece to use. For the simulated “parchment” project I am using 100 lb vellum surface Bristol Board. To begin the transformation, I am using tea to color the “hair” side. My first thought was to use a brush, but because I don’t want the paper to get too wet I used a sponge instead. There doesn’t seem to be a big difference in the before and after, but I will let it dry overnight and look at it in the morning. The paper is curling on the edges. I decided that I really didn’t like the tea dye, so I started over with a new piece of Bristol board using dilute walnut ink instead. Then after taping the paper to my work surface, due to curling, I used dilute iron gall ink and a small stenciling brush, to add “hair follicles”. For the flesh side, using a small brush, size 3/0 and dilute walnut ink, I added capillary/vein lines. I hope the photos are sufficient to convey what I was doing. The light isn’t very good in that part of my residence.